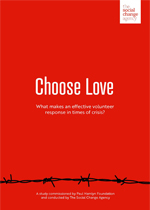 What makes an effective volunteer response in times of crisis? This report on Help Refugees’ work and their response to humanitarian crises aims to share lessons and insights with grassroots groups and volunteer organisations, as well as the wider funding community. The study was commissioned by Paul Hamlyn Foundation and conducted by The Social Change Agency.